Modern-day tellings of heroes and villains are no stranger to bizarre backstories, but the Saints Row series (as in everything) pushed the storytelling limits with its unnamed protagonist. From gang grunt to crime lord to pop culture idol to President of America and finally, the champion of humanity. How can this insane plot arc hold up in the franchise’s fourth installment? Very, very well, as it turns out. Between the events of Saints Row the Third and Saints Row IV somehow the boss of the Saints became the President of America, but that’s hardly the focus of the game. It’s a great framing device and is used liberally throughout the plot for comedic effect, that’s about it. The real meat of the game is in the adventures of the boss (the player) and zany ex-FBI hacker Kinzie Kensington, as they make their way through a simulated version of the city of Steelport. This all happens after Earth is invaded by Emperor Zinyak of the Zin Empire, a rather eloquent and well-spoken oppressive dictator alien of sorts. Over the top enough for you? By means of all sorts of space science, which is acknowledged and dismissed as is fit to keep the plot going, almost everyone in the Saints gets abducted and thrown into a simulation. Once Kinzie breaks the boss out of his or her simulation, it’s time to save everyone else. While “Save your friends” doesn’t seem a fitting goal for a Saints Row story, what’s actually involved in doing so absolutely fits. Each of the members of the Saints has been imprisoned in a simulation of their own personal Hell. That means rescuing Pierce from a marketing disaster (read: giant sentient Saints Flow can) and liberating Shaundi from her former self, and those are just two of the more normal ones. The simulations provide varying amounts of backstory on each character and unique gameplay pieces to break up the open-world gameplay and anti-alien narrative. Considering how much time will be spent goofing off in the simulation, the story pacing plays out with a level of smoothness often only achieved in more linear games. So what can the President of The United States get up to while not out saving friends? Well there’s the car chases, pedestrian punting, shootouts with police and other depraved shenanigans that a gun-toting lunatic could get into when given too much freedom and health regeneration in a large city. As far as opposition goes, though, instead of three different gangs to conquer in Steelport, as it is the same city from SRTT, there’s simply the Zin police force now, and they are freaking ruthless. The Zin are easily my favorite open-world enemy I’ve ever faced in a game of this nature. While early on they’re not much to be reckoned with, a good fifth of the way into the game their full arsenal of cars, tanks, UFOs, super-powered warden beasts and more will constantly berate you and your friends with stupid amounts of firepower when pissed off. How does the boss plan to deal with these new, hyper-aggressive opponents? Super powers. Most of the time when in the simulation the boss can engage his or her superpowers. At first that simply means a super sprint and jump, some gliding, and an ice blast. However, the arsenal grows steadily and the upgrades go a long way to flesh out functionality, variety and control over both the utility powers and the combat ones. Each of the combat powers have three elements which change the powers’ effects, essentially giving you 12 powers to mess around with. The guns, which are still customizable (the engine for which has been improved and better-paced from SRTT), remain well implemented and will be the main method for actually dispatching enemies, but the powers give a massive degree of control and freedom when dealing with the Zin. It’s difficult to give players such a diverse and potent arsenal and still have challenging enemies, but Saints Row IV balances threat and power rather well. At least until max level. Between the main story and just horse doodling around in the city there exists a vast variety of activities. As with the weapons, powers, and plot, the activities are also far better paced than they were in SRTT. The plot brings you new weapons, characters and vehicles, which also brings you new activities and diversions instead of dumping them all on you early on. The returning diversions are decent warm ups (flashpoint battles, rare car retrievals and assassination missions) but the two new diversions are welcome additions. One diversion, a multi-tiered series of shootouts with various Zin forces, has the president assaulting massive domes dotted throughout the simulation. The other group of diversions are known as Tower Ascensions, which are superpower-enabled platforming sessions. The diversions are very much that: diversions, but they’re short and scattered in such a way that they’ll feel appropriate once attempted and appreciated upon completion. The activities such as Mayhem, wherein things must be destroyed constantly and excessively to rack up combo multipliers and points, return, but with an alien-twist. Instead of helicopters there are UFOs and mechs, and while Mayhem hasn’t changed much, it’s really fun to destroy the city in a UFO. Genki, the insane mascot with a penchant for unmitigated murder, also returns from SRTT, but instead of an obstacle course shootout he’s got players using telekinesis to throw various things in the world through the proper rings. Sounds simple and easy right? Well it’s not. The controls are absolutely adequate, but finding the right objects and corresponding rings in time is more challenging–and fun–than expected. The mix of new and returning activities is just right, and all of the new activities take proper advantage of super powers as well as leveraging them well in returning ones. In all of the Saints Rows, IV definitely has the best distractions by a space-mile. Let’s say that’s a very large bit of distance. The only piece of Saints Row IV that didn’t range from great to freaking fantastic is its presentation. While the voice acting is top shelf yet again, especially with notable performances from Terry Crews as Ben King and Keith Davids as himself, and the sound design is fine in general, the visuals really show their age. With all of the sci-fi deliciousness that are the laser effects, super power particle explosions and neon lights of simulated Steelport, the frame rate can drop a bit at times. Volition was prepared for this, the drops are clearly smoothed out, but they’re still noticeable, especially when piloting the mech suit during mayhem or open-world gameplay. On the note of presentation, Steelport doesn’t quite have the life it had in SRTT. This isn’t because things were taken away, but since 90% of the time superpowers will be used instead of cars, most of the city will be experienced from above. There’s a LOT to do, and knocking cars aside while sprinting through the streets doesn’t get old, but the city is more of a playground now than a lived-in world. This may disappoint some, hence the mention, but I got over it pretty darn quick while leaping from rooftop to rooftop. Saints Row IV surprised me. At every turn the right moves were made, and the plot is so self-aware you’d think it’d have its own bodily functions. The story is full of hilarious scenarios, silly plot devices, and quite a bit of backstory on the entire Saints Row franchise. Between the story’s unfolding, the amount of extra content is overflowing, and it’s all enjoyable. Most importantly, Saints Row IV completely rights and polishes off SRTT’s biggest issue: pacing. Things you unlock feel earned, and time is rarely wasted; even when just meandering throughout the city, there are useful things to do and find. Saints Row IV is over-the-top, done to near-perfection, and while it may not look like a visual masterpiece, it’ll leave you feeling satisfied. 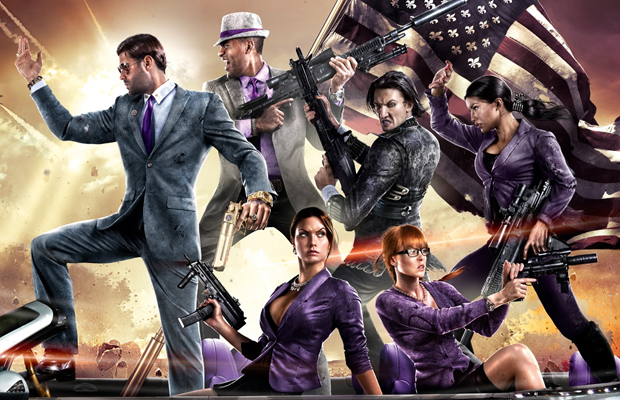 Saints Row IV is developed by Volition Inc., and published by Deep Silver. A copy of the game for PlayStation 3 was provided for the purpose of review.